As [Philip and Nathanael] approached, Jesus said, "Now here is a genuine son of Israel — a man of complete integrity." "How do you know about me?" Nathanael asked. Jesus replied, "I could see you under the fig tree before Philip found you." Then Nathanael exclaimed, "Rabbi, you are the Son of God — the King of Israel!" Jesus knows us. That's because he really knows what is inside our human hearts. That's because he walked among people just like us. That's because he made us and knows our inner being. And, if we are Christians, that's because he lives inside us now. Jesus, however, doesn't want to know us to condemn us. 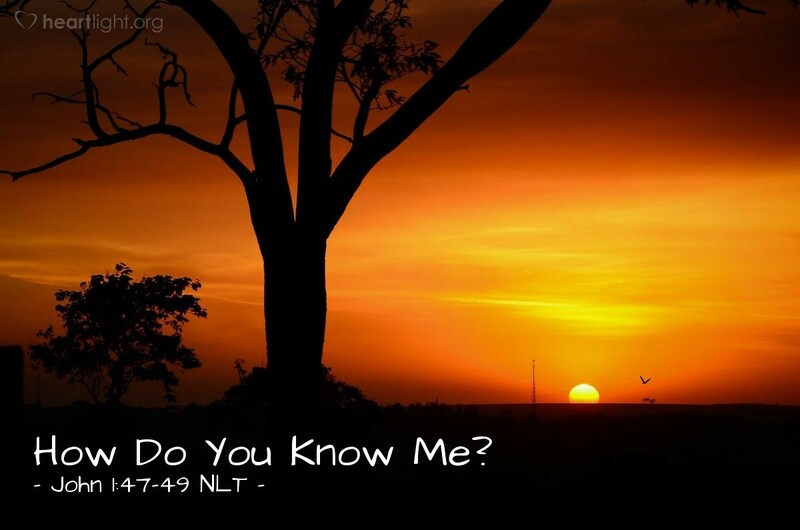 No, he knows us to help bring about our best, our holiest, and our most beneficial selves. So let's not hide from him. Instead, let's confess him as our Lord, Savior, Friend, and Teacher. Let's invite the Son of God into our hearts and our lives to make us all that God wants us to be. After all, he left heaven's glory and suffered the indignities of the Cross to redeem us! O precious and righteous Father, forgive me for my sin. Search me and purify me from secret sin. Redeem my heart and purify my desires. I not only confess that Jesus is your Son, but I also want him to transform my life, so I make this request in his name. Amen.